7Br, 6Ba With Pool - Sleeps 22 - Newly Renovated And Decorated!! Book now for Beach Dreams! This is a beautifully furnished vacation home with amazing gulf views and a private pool. You will enjoy the open and spacious living area complete with large sectional sofa, flat screen TV, and gorgeous dining table for 8-10. The upgraded kitchen is a treat and includes bar top seating for 4. This is a perfect space for everyone to gather! If staying inside isn't for you, the living area opens onto an oversized covered porch and open deck which is sure to please. There is abundant seating for conversation and dining. Many guests tell us that this is their favorite part of this property! 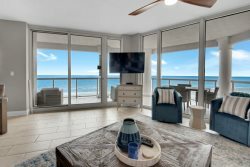 The gulf views will not disappoint! This house boasts 7 bedrooms, all beautifully decorated, with one being an adorable bunk room complete with built in bunk beds. All bedrooms have a private TV for those times when you simply want to slip away! Of course, you could just slip away to the private pool downstairs or just across the street to the beautiful Gulf of Mexico. Inside or outside, this house is sure to make your Beach Dreams come true! An added bonus is the park located behind the house. This includes a basketball court which also doubles as a roller hockey rink, playground equipment for the little ones, as well as a large track with a huge grass area. This property is a guest favorite and often books well in advance. Don’t miss out on this opportunity! Our stay was great. The house was wonderful and very close to the beach!